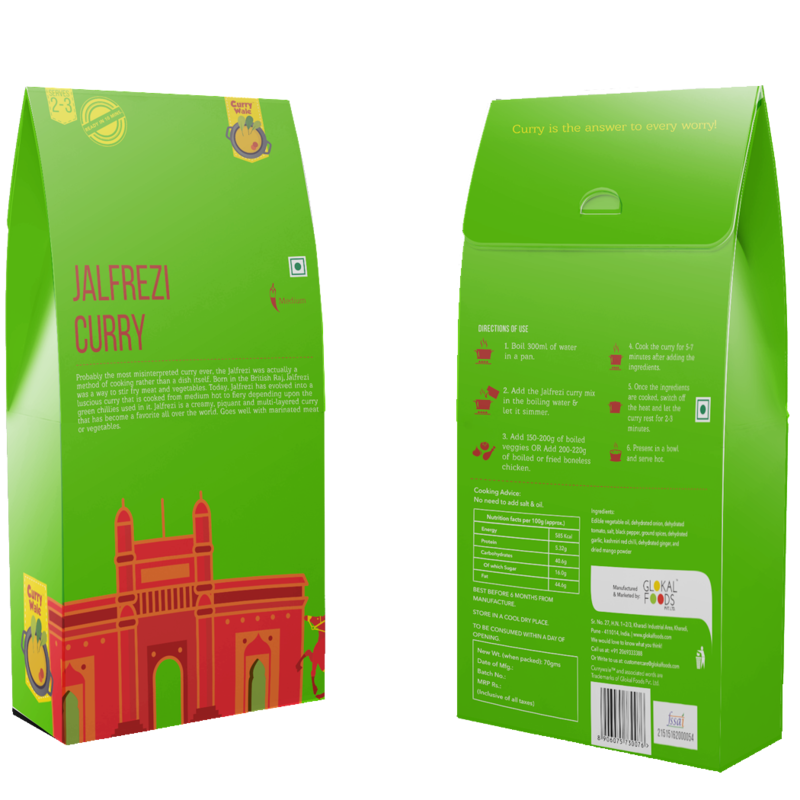 CurryWale is a brand of ready-to-cook mixes that we’ve worked with right from creating it’s brand identity. With the packaging design we wanted to take forward the brand essence but also make sure that the packaging meets key objectives such as high-degree of differentiation from other brands in its category, high shelf-visibility etc. 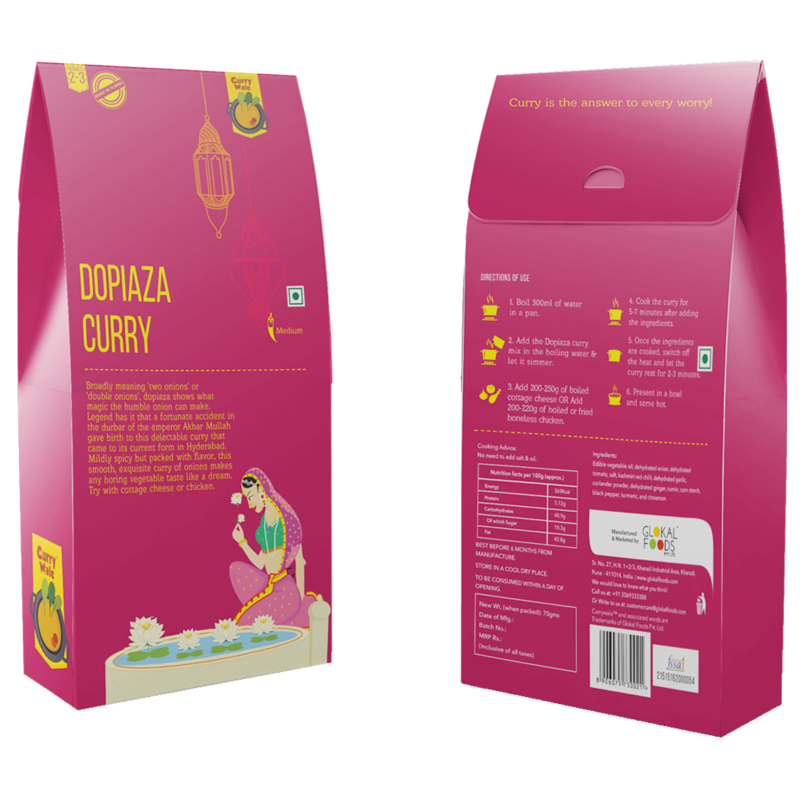 After conducting research on ready-to-cook mixes available in the market, we decided to go ahead with the approach where the origin of each curry is portrayed with a beautiful illustration along with a write up about the special curry mix. The idea was to focus on the taste, flavor and the origin of the products in order to arouse the customer to try the products as they give a deeper insight into the products. Britain’s favourite curry, Balti has its roots somewhere in between the streets of Birmingham and the narrow lanes of Baltistan in Pakistan. 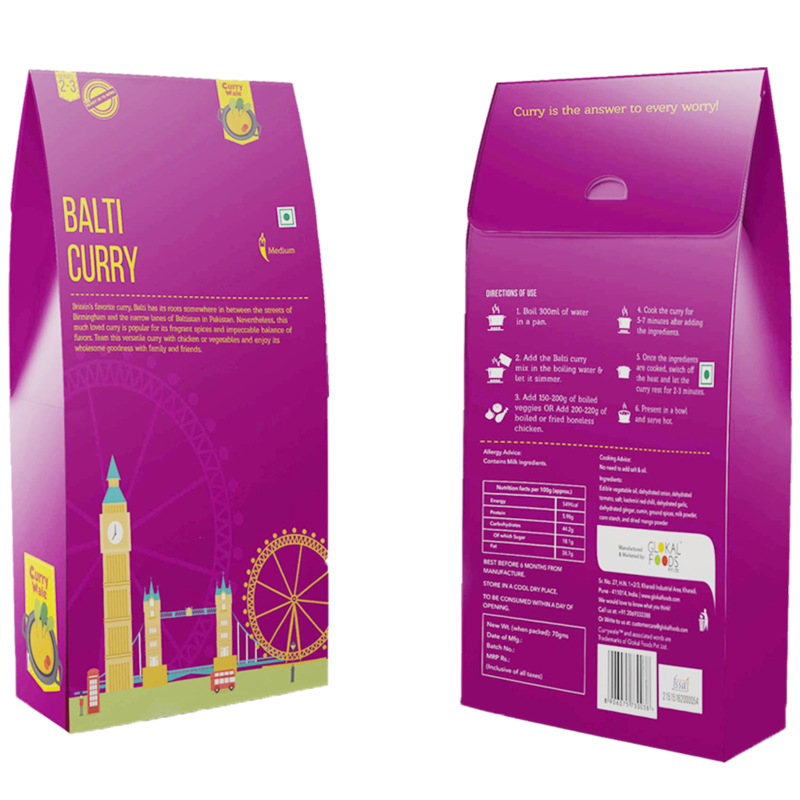 Nevertheless, this much loved curry is popular for its fragrant spices and impeccable balance of flavours. Team this versatile curry with chicken or vegetables and enjoy its wholesome goodness with family and friends. 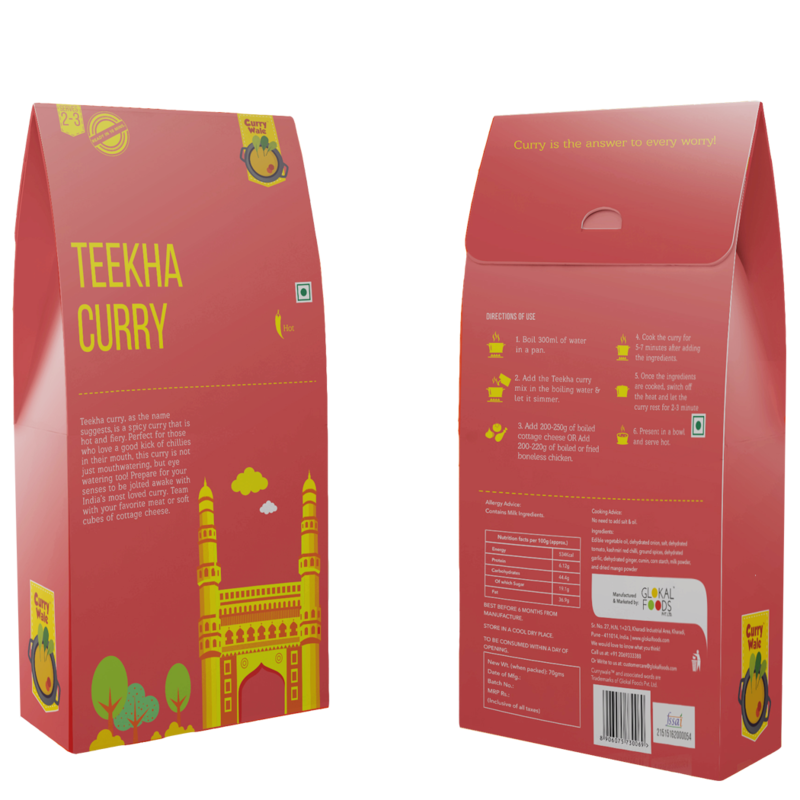 Teekha curry, as the name suggests, is a spicy curry that is hot and fiery. Perfect curry for those who love a good kick of chillies in their mouth, this curry is not just mouthwatering, but eye watering too! Prepare for your senses to be jolted awake with India’s most loved curry.Team with your favourite meat or soft cubes of cottage cheese. 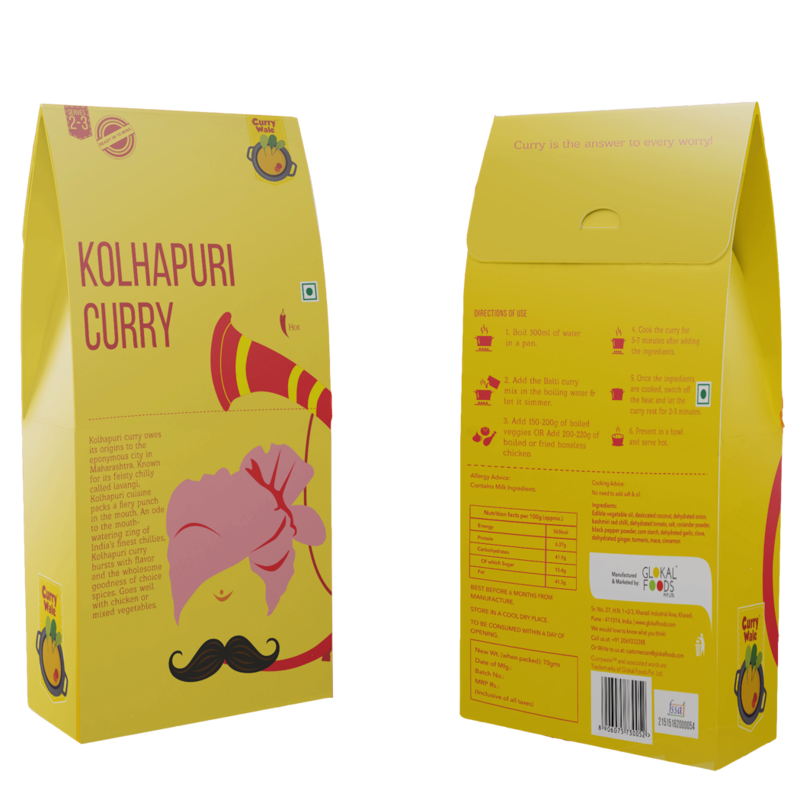 Kolhapuri curry owes its origins to the eponymous city in Maharashtra. Known for its feisty chilly called lavangi, Kolhapuri cuisine packs a fiery punch in the mouth. An ode to the mouthwatering zing of India’s finest chillies, Kolhapuri curry bursts with flavour and the wholesome goodness of choice spices. Goes well with chicken or mixed vegetables. Probably the most misinterpreted curry ever, the Jalfrezi was actually a method of cooking rather than a dish itself. Born in the British Raj, Jalfrezi was a way to stir fry meat and vegetables. Today, Jalfrezi has evolved into a luscious curry that is cooked from medium hot to fiery depending upon the green chillies used in it. Jalfrezi is a creamy, piquant and multi-layered curry that has become a favourite all over the world. Goes well with marinated meat or vegetables. Broadly meaning ‘two onions’ or ‘double onions’, dopiaza shows what the magic the humble onion can make. Legend has hit that fortunate accident in the durbar of the emperor Akbar Mullah gave birth to this delectable curry that gave birth to this delectable curry that came to it current form in Hyderabad. Mildly spicy but packed with flavour, this smooth, exquisite curry of onions makes any boring vegetable taste like a dream. Try with cottage cheese or chicken. 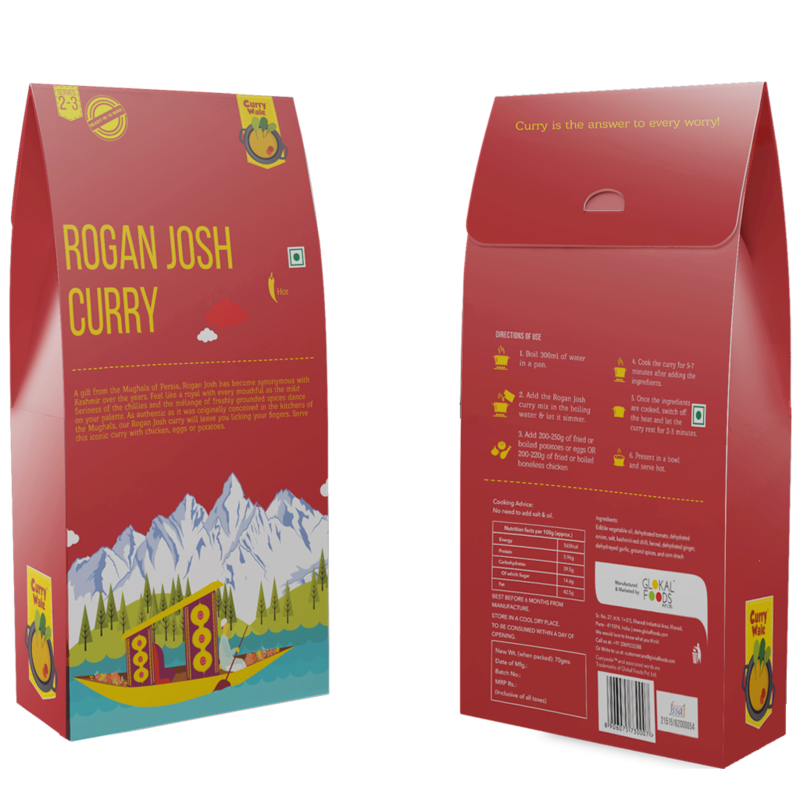 A gift from the Mughals of Persia, Rogan Josh has become synonymous with Kashmir over the years, Feel like a royal with every mouthful as the mild fieriness if the delicious chillies and the mélange of freshly grounded spices dance on your palette. As authentic as it was originally conceived in the kitchens of the Mughals, our Rogan Josh curry will leave you licking your fingers. Serve this iconic curry with chicken, eggs and potatoes. The king of curries, Makhanwala is a buttery wonder that will make your waltz with pleasure. A perfect creamy cashew gravy Makahanwala curry is your answer to a dull day. 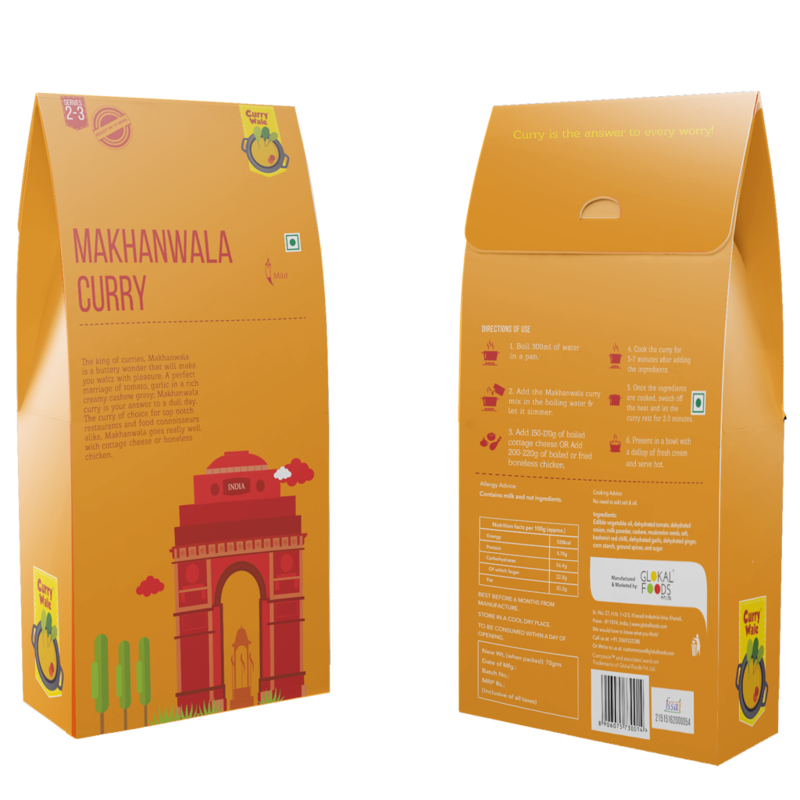 The curry of choice for top notch alike, Makhanwala goes really well with cottage cheese or boneless chicken. We strongly believe that the kind of ideas & thinking that one gets from Wizdumb is clutter breaking & out of box. 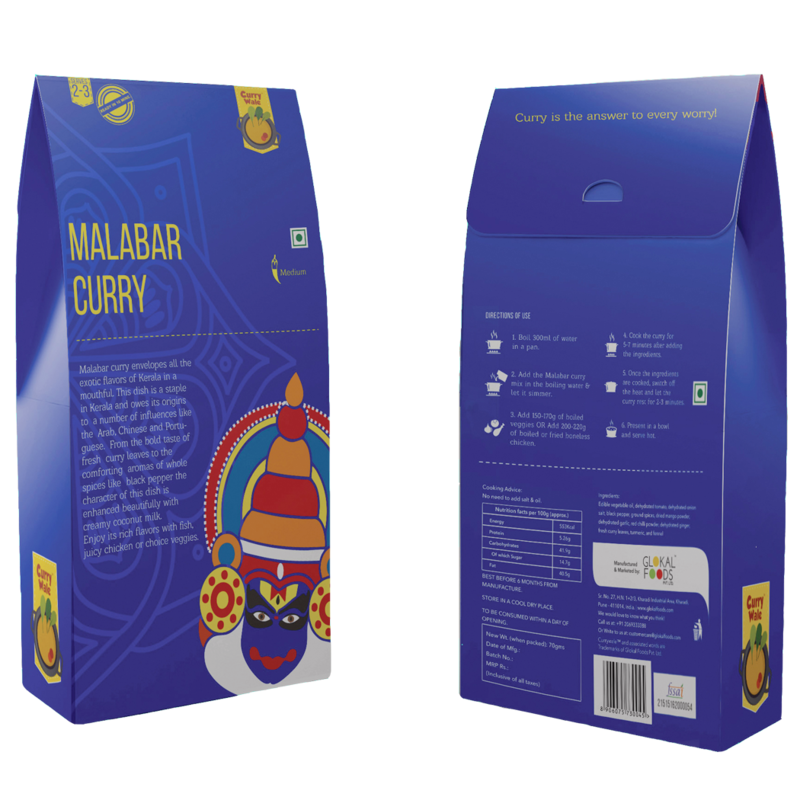 Our Brand “Curry wale” is a new brand & right from the logo to the packaging has been designed by Wizdumb. It’s the commitment towards their work & the involvement of the agency that results in good output. Let’s tell your story to the world.